Trends of subjective well-being (SWB) in transition countries are peculiar: they show substantial changes that are more strongly correlated with the trends of GDP than in other developed countries. 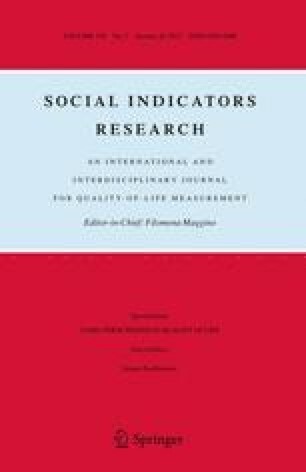 This paper examines the role of the trends of GDP and of social trust in predicting the trends of well-being. We find that the strength of the relationship between social trust and SWB over the medium-term is comparable to that of GDP. We conclude that in the medium-term, even in countries where material concerns strongly affect well-being, social trust is a powerful predictor of the trends of SWB. However, in the short run the relationship between social trust and SWB does not hold and GDP stands out as the only significant correlate of SWB. The sixth column of Table 5 informs that the percentage of missing data is on average <1 %. Only in the case of the index of social trust the percentage of missingness raises to 1.4 %. However, such a small percentage does not raise any particular worry for the reliability of our estimates (Allison 2001). Data missingness is further analysed across waves in Table 6. Figures inform that also in this case percentages of missingness are negligible and, according to the literature on data missingness, they are not likely to affect estimates (Schafer 1997, 1999; Allison 2001). Table 7 informs that in the pooled sample, factor loadings range from 0.80 to 0.85 thus suggesting that the three variables contribute equally to the definition of a latent concept that we call “social trust”. When observing results across waves (see Table 8), we notice that discrepancies arise mainly in the first and third wave where factor loadings range from about 0.79 for the helpfulness variable to 0.84 for the fairness variable. The slight variability among factor loadings both in the pooled sample and within waves convinced us of the opportunity to build an aggregated index of social trust resulting from the standardized weighted average of the three items. See Tables 9 and 10.